“I’ve been working on a series of portraits. None of them is of existing people, but they are familiar. My roll call is growing and it contains some of my favourite characters. They include Grammy winners (gracious in acceptance of awards), revolutionaries, fanatics, anthropologists and missionaries (good for showing us how to live), savages (good for showing us how far we have come and how not to live), radicals and the generally angry, amongst others”. The lady who sits astride a cushioned stool in Obelisk is a composite of various different ideas and characteristics, and a typical example of Boakye's working process. Based on drawings both from life and memory, she dominates the canvas, fixing the viewer with a rather provocative glare. While her age is unclear, her striking, minimalist attire suggests the social standing of a privileged individual. The painting's title refers to the sitter's upright, tapered posture and the ambiguous arrangement of feet beneath. Those of the lady tuck in between those of the stool; she steadies herself on her own tiptoes, while at the same time appearing to stand on four legs like some sort of modern day satyr, the mythical symbol of sexual promiscuity. Cemetery belongs to the same series of works as Obelisk. It is a painting less concerned with death and its emotional ramifications, than with the correct protocol for mourning. Again, a single female figure occupies the canvas. Isolated by the hard, grey concrete that surrounds her, she is very much alone. 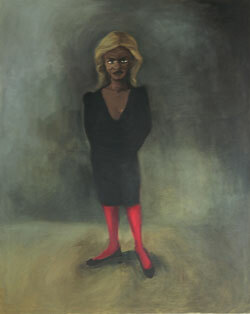 Her appearance is contradictory; a black dress, the traditional colour of mourning, with garish red tights. In a similar way, her facial expression is not what we might expect; a tight, twisted smirk, where we would usually expect to see sadness or sympathy. With no other clues as to the circumstances, the viewer is left to complete the story in his or her own mind. 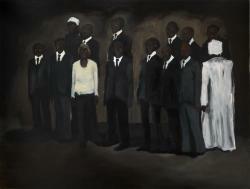 Ambassador, like Grammy, belongs to Boakye's first series of portrait paintings. The work's cool palette and simple, uncluttered composition lend an air of familiarity to what, on closer inspection, is a rather incongruous scene. The subject, a young woman whose crude appearance is at odds with the sophistication of both her pose and the luxurious armchair in which she is seated, is not what we might expect. Could she really be the ambassador referred to in the painting's title? Playing with notions of power and access, Boakye invites us to consider what is or is not appropriate in certain social situations. 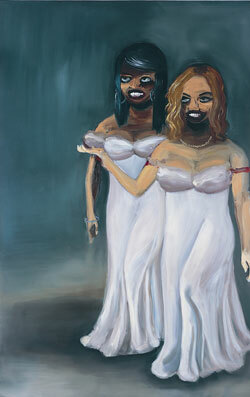 Dressed in white like a pair of covetous bridesmaids, and grinning like Cinderella’s sisters, two women step forward to bathe in the acclaim of an unseen audience. 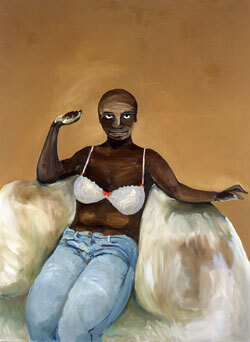 The painting’s title, Grammy, refers to the annual American music industry awards ceremony. 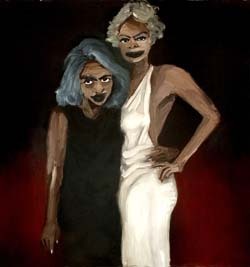 Portraying her would-be glamorous subjects in thick, slobbering paint, Boakye repackages them as ten-a-penny celebrities of questionable talent or significance, passing plankton on which contemporary life’s insatiable hunger for stardom briefly stops to feed. Alongside being an artist, Boakye is also a writer; paint, for her, becomes a tactile language from which fictions are formed. 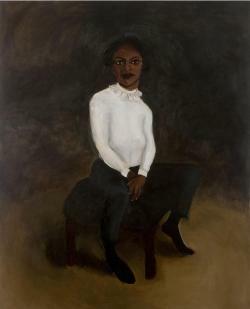 Boakye’s imaginary scenes unfold with all the richness and drama of a novel: their open-ended suggestion of setting, character, predicament become intrigues for viewer interpretation. In Diplomacy II, a group of figures gather in ceremonious congregation, their bodies simultaneously defined and made uniform amidst the canvas’s haunting charcoal monochrome. Inspired by a photograph of a political delegation, Boakye uses the composition of staged portraiture to create a piercing psychological tension, as rows of dotted eyes stare purposefully at the viewer suggesting their unwelcome intrusion.